Take the Harvard men’s hockey team, which had found its groove over the last week and was firing on all cylinders. Add back its Olympian for good measure. Put this team in Providence, R.I., to face a Brown squad that has hovered near the bottom of the ECAC all season. This is the recipe for an easy two points, right? Not exactly. 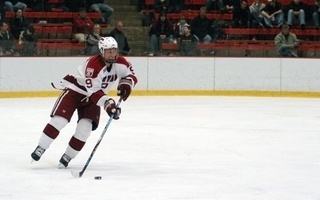 On Friday night, the Crimson (13-11-4, 11-7-3 ECAC) followed all those steps in a chippy, fast-paced fight against the Bears (7-17-4, 6-14-1), only to unravel in a 6-4 loss. The crowd could almost pretend it was Feb. 2007, because that was the last time Harvard conceded six goals to Brown—that game ended in a tie. Special teams ruled the day, and the return of junior Ryan Donato from the Pyeongchang Winter Olympics could not stave off a hat trick from Bears alternate captain Sam Lafferty. With the bench boss’s son back in the forward mix, the lines underwent some shuffling. In an effort to preserve last weekend’s successful top six, sophomore Ty Pelton-Byce and freshman Jack Badini retained both their centerman duties and their linemates but were bumped down a rung in the lineup. This allowed for tri-captain Jake Horton to center the top line, with Donato playing left wing for the first time all season. Junior goaltender Michael Lackey was given the nod this time. With three minutes to play in regulation and down 6-3, Harvard pulled Lackey in hopes of cutting Brown’s lead. With the extra skater on, the Crimson did indeed manage to do that. Sophomore defenseman John Marino fed Donato at the blue line for a hard shot that Bears rookie Luke Kania was able to shrug off. But Pelton-Byce and junior forward Lewis Zerter-Gossage were both causing chaos in the slot. As the puck bounced off Kania, Pelton-Byce chipped it right into the net. The Madison, Wis., native has logged at least a point (3–4—7) in each of the six consecutive games he’s played at center. Harvard’s fourth goal inched the team closer to Brown, but the comeback effort ultimately fell short. The Crimson was chasing the Bears all game after the home team came out firing in the first, outshooting the visitors, 14-10. Brown led, 1-0, after the first intermission, breaking the ice against Harvard for the first time since Nov. 7, 2015. The Crimson’s misfortunes continued to start the second. A rare misplay at the point from sophomore defenseman Adam Fox sent Bears sophomore Trey Dodd off to the races to score a shorthanded tally low glove-side on Lackey. The disjointed power play unit was looking more and more like the team that, two weeks ago, could not execute on 17 straight man-advantage opportunities. 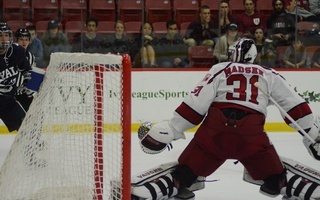 In the very next 5-on-4, though, Badini drove to the net and cashed in on his own rebound to break the ice for Harvard. Not long after, Zerter-Gossage suffered a knee-on-knee collision while the Crimson was already up a man, handing the visitors a two-man advantage. A pretty passing play between Zerter-Gossage and Pelton-Byce found freshman point-man Reilly Walsh, well-positioned in the low slot, who chipped the puck over the glove of Kania. 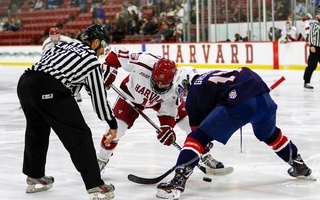 Harvard had closed the gap, and the game was tied, 2-2. 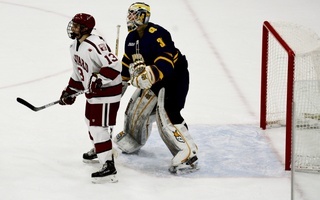 The middle frame was not without its antics, as shoving escalated to cross-checking behind the Crimson net. Senior blue-liner Wiley Sherman found himself in the middle of a heated scrum after cross-checking senior Tim Lappin into the boards. Both teams sat for incidental roughing penalties, and Sherman was assessed the additional boarding infraction. The final period contained the same chippiness, as tallies by Brown captain Josh McArdle and Lafferty pulled the home team ahead. A visibly frustrated Harvard team could do little but watch as Lafferty found his legs for two more quick strikes in the frame. 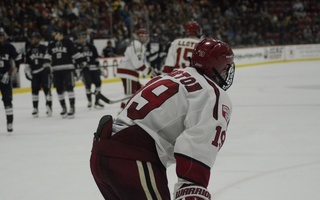 Donato’s goal, the Crimson’s third of the night and his team-leading 22nd, was in effect cancelled out by the Bears offense. On a night that soured quickly, perhaps the only positive for Harvard is the continued production of its power play unit. Three of Friday’s four goals came on the man-advantage, and the fourth goal came with the extra skater on. The Crimson has now cashed in on 10 of its last 17 opportunities (58.82%), dramatically reversing the trend from late-January’s dry spell. Still, the team had some crucial chances to take the lead against Brown where it fell short. After a shutout performance last week against St. Lawrence, Lackey’s game between the pipes also left something to be desired. The junior turned away 23 of the 29 shots he faced. If the team hopes to make postseason run, its goaltending will have to be nothing short of stellar through the ECAC playoffs. Coach Donato would not commit to any particular net-minder, but tri-captain Merrick Madsen could see ice time in Saturday’s tilt with Yale after a strong performance last weekend against Clarkson.